A common and versatile tool in all toolboxes is a set of slip joint pliers. This tool is so common that it is often the first type of pliers that comes to mind when the word “pliers” is mentioned. While this might not exactly be a high precision instrument, it is useful in any number of jobs and is quite the catch all tool. They’re very handy to keep around the home or office for basic fixes. Just because this is a basic tool doesn’t mean you should buy whatever pair you happen to see first. You’ll be using this tool often, so you want to be sure you pick the right set of slip joint pliers. Our top pick is the Channellock 526. Channellock is a quality company known for its quality products. Their attention to detail and dedication to producing high caliber tools that are well designed, well made, and well used. A company started by a blacksmith 130 years ago, Channellock is rooted in an in depth understanding of what goes into making quality tools. Consumers looking for a quality product made in the USA will be happy to learn that the Channellock pliers are not only made in the USA but the raw materials are also American. It is made out of high carbon drop forged steel. High carbon steel is harder than regular steel, has a higher melting point, and is less malleable than steel. This makes the pliers useful in a larger range of jobs than pliers made of regular steel. It’s unlikely you’ll be working with molten lava, but you can rest assured that high temperature jobs will go smoothly and your pliers will remain in the same condition the whole way through the job. At six and a half inches, these Channellock pliers are the right size for many jobs. They can fit into tight places, but they are also large enough to handle a variety of tasks without losing effectiveness by being too small. The jaws open wide enough to grip something approximately two inches thick. The Channellock 526 does have a nose that is slightly wider than their 546 pliers, so it can’t get into every tight space. The grips on the Channellock 526 are the simple blue grips that Channellock puts on all of their tools. The grips aren’t too large, they don’t take over the entire tool and they don’t overwhelm your hands. They are padded just enough to keep you from injuring your hands on the steel of the tool, but not so large as to get in the way. These grips are by no means ergonomic, so if you need to hold these pliers for a long time or in an unconventional way, you might get uncomfortable quickly. This may not be a consideration for DIYers, but professional mechanics should keep it in mind when considering this purchase. When considering the grips, bear in mind that this pair of pliers weighs 10.7 ounces. You won’t feel like you’re lifting weights just to pick it up, but it will feel very solid in your hand. Reviewers found the weight of this tool reassuring. It feels as sturdy as it is. Some attribute this to their confidence in American made tools, some attribute it to the quality of the materials or the workmanship. Whatever the case may be, this pair of pliers feels good in your hand. The slip joint in the Channellock 526 is easy to activate, but not too easy. You won’t find it slipping from one setting to another in the middle of doing its job. There is no play between the two pieces of steel at the joint, they are held firmly together. Not only do they start out this way out of the package, but the joint stays tight after repeated use as well. If, however, you do have a problem with these pliers at any time, Channellock has a lifetime warranty on all of their tools. They guarantee that their tools will not break or fail. This does not cover regular wear and tear or breakage from improper use. They will not replace your pliers simply because they’ve worn out or you’ve been using them in unusual ways to cause the breakage. Rather, Channellock has such faith in their production value that they guarantee you will not have a problem with their tools due to any failure of workmanship on their part. Finally, there is the price point of these pliers. While some reviewers were concerned that a lower price in comparison to other American made tools might mean lower quality, we found that although this tool might not have a high price, it certainly has a high value. Between the quality of craftmanship on the tool itself and the long useful lifetime, it is well worth its price, and the lower price point is simply an extra perk. Our second choice of slip joint pliers is the Irwin Tools Vise Grip slip joint pliers. One thing many reviewers pointed out was the fact that Irwin has moved their production overseas. Irwin tools are no longer “Made in the USA,” and this gives some people pause when choosing tools. Although the company did move production overseas to save on cost, this is still an American company, owned and run. The product is not, however, made in America. When considering the Vise Grip pliers, bear in mind that these pliers are indeed ten inches long. Some reviewers loved this, others were not as happy about it. One of the good things about a larger pair of pliers is the increased leverage. Those who don’t have as much hand and arm strength appreciate having the extra leverage to get tough jobs done without having to try too hard. However, the larger size also means that this pair of pliers might be too large for some of your regular everyday tasks. The large size also means a larger weight. The Vise Grip pliers weigh twelve ounces. This much weight can initially feel like a good, sturdy tool, but over extended use the additional weight can lead to hand fatigue. If the hands fatigue, then you aren’t working as efficiently and your task will take longer to accomplish. The designers at Irwin anticipated this hand fatigue problem, and put heavy duty grips on the Vice Grip pliers. These grips are not simply plastic coating and they’re not just a little bit of cushioning. These grips are thick and molded to the shape of a hand. They support grip anywhere along the long handles of these pliers, and facilitate efficient use of the tool. The Vice Grip is well constructed and sturdy. It holds up to not only everyday uses, but some users have taken advantage of this sturdy construction to use the tool in a variety of unintended ways. One consumer even used them as a hammer when in a pinch. While this type is use can be handy, it is certainly not recommended, especially because improper use can lead to damages that will not be covered by the warranty. The Vice Grip pliers are made from nickel chromium steel. Though this lacks the durability and higher melting temperature of high carbon steel, nickel chromium steel, stainless steel, is still of high quality and has the added feature of maintaining its looks. While tools are not primarily made to be nice to look at, the high quality steel that maintains its looks makes maintenance on the Vice Grip easier. If the metal of your tool is in good shape and isn’t dingy, it’s easier to see any flaws in the metal and know that they aren’t just surface blights on the tool but more likely they are damage to the steel and might be indicative of the need to replace your tool. If you’ve been using it as a hammer or other tool besides pliers, this is likely to happen much sooner than if you use the pliers properly. Priced at $12, these pliers are more expensive than the Channellock pliers, but you are litterally getting more for your money. You are getting a larger tool in the first place, plus it has significantly more material on the grips. Because of its hefty size, you might also be getting the use of more than just one tool out of this single pair of pliers. Our third pick for slip joint pliers comes from Craftsman. The Craftsman brand is well known and nearly beloved in many households. As a long established brand with strong ties to the Sears department stores. Any Craftsman tool purchased anywhere can be exchanged at Sears. This includes any incorrect orders or warranty servicing type exchanges. One thing to be mindful of in that case, though, is that you might wind up with another brand of product that might not be American made. All Craftsman tools are and always have been one hundred percent American made. This is one of the things that has made them an American institution. The Craftsman pliers are made from forged alloy steel that has been heat treated. This extra treatment increases the durability and strength of the steel. It will stand up to whatever type of job you attempt with it, but is also designed to work easily enough so that you can use it regardless of skill level. The jaws have a powerful grip that give you the certainty that you will be able to complete the task at hand with these pliers. A unique facet of these pliers is the flush rivet at the slip joint. This gives the pliers a lower profile and makes it easier to get them into tight places to do your job easily and efficiently. This unique feature was a real hit with reviewers. They found the slip joint still functioned properly easily. While some models of slip joint pliers have a tendency to slip between settings during use, these pliers maintain at whichever setting you place them and stay there until you decide to change them to a different setting. The Craftsman pliers are six and three quarter inches long and weigh just over eleven ounces. They are heavy for their size; this is due to the fact that they are made almost entirely from steel. The grips are vinyl coating over the steel of the handles. These grips are functional enough to give you a good grip on the handles, but they don’t provide a lot of cushioning for your hands during extended work time. Hand fatigue is a certain possibility with the Craftsman pliers. Because they weigh so much for their size and they don’t have much by the way of padding in the grips, hand fatigue is likely. If you will be using your slip joint pliers frequently or for a long duration, this pair might not be the best choice for you due to this factor. If your hands are accustomed to heavier tools or if you won’t be using these frequently or for a long time, then the sacrifice of significant handle grips would be minimal for you and these pliers could easily work. At $11, these pliers are in the middle of the price range. They come from a company whose name is equivalent with American quality work. They function well, and they come with a lifetime warranty that is serviced not only by the Craftsman company itself but also by their retail partners at any Sears department store. The Stanley Bi-Material Slip Joint Pliers are our budget pick for this list. Stanley produces decent quality tools at a very affordable price. In fact, the price is so affordable that on Amazon this pair of pliers can only be purchased as part of their “add on” program, in which you have to buy at least $25 of other items in order to get this item at its very low price of $2.85. While this low price might have you concerned about quality, know that this tool comes with several features that make it very useful, especially at such a low cost. At six inches long and just over seven ounces, this is the smallest and lightest set of pliers on our list. 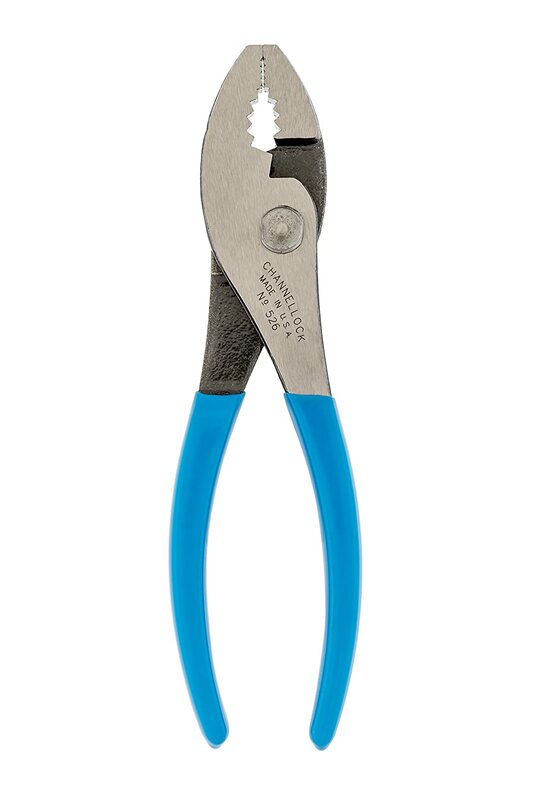 They can fit into nearly any job you might want to use them for, and there is very little concern for hand fatigue with these pliers. At such a light weight, it is highly unlikely that your hand will tire while using these pliers. 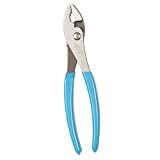 If, however, that is a concern due to extended use, these pliers come with heavy duty grips on the handles that are molded to cushion your grip all along the length of the handles. Stanley covers these pliers with a limited lifetime warranty. The main limit they place on their warranty is that it is only applicable to the original purchaser of the tool. There are also the other usual limits of proper use, storage, and maintenance. If you abuse or misuse your tool and try to get it fixed under warranty, it’s not going to work out in your favor. However, at this fabulous price, it’s just as easy to go out and buy a replacement yourself rather than bother with the hassle of returning the item under the warranty. Stanley does not manufacture their tools in the United States, and the materials are not sourced from America either. However, the materials used are of high quality. The forged steel is treated with a chrome finish to prevent rust and other wear. Much like the Irwin pliers, this maintenance of appearance helps you keep a better eye on your tool and helps you see if there is a problem before it becomes a big problem. As an all around important tool, pliers will be used to grip all sorts of objects made from a variety of materials. To be certain your pliers will work well and for a long time, they should be made from durable material that will not deform and have cutting edges that do not dull easily. Our list encompasses pliers made of different materials, all of which have their own advantages and disadvantages. Know what type of material and work you are likely to be doing most often, and choose a material that will withstand the job and the test of time. Once again, due to the frequency of use, consider how much a pair of pliers weighs. You will be picking this up frequently, so take into account the weight. If you’ll be using them for an extended period of time, you will likely prefer a lighter pair of pliers. Alternatively, a heavier pair might feel more substantial in your hand, giving you greater confidence that you are using a solid tool that you can count on to do whatever job might come your way. Be aware, though, that with a heavier tool, your grip will tire faster and not be as effective. If you will be using these pliers every day or for a long time, consider something that’s lighter. If you plan on keeping them around for a handy tool at home or in the office, then you do not need to be as concerned about the weight of your pliers. If you are very conscious of where your tools and other products come from, you’ll be looking for the comforting “Made in the USA” stamp. Some people look for this because it is comforting to know that products made domestically are subject to US laws and regulations, that the raw materials have been properly inspected, and that the product has been made to a high standard. Others are interested in buying domestic products to keep American money in America. Still others do it out of patriotism. In order to buy made in the USA, the price is often higher than imported goods. On the other hand, because of this price difference, some people prefer imported items. These folks don’t question the quality of the product or the standards by which it was made. Sometimes the allure of a lower price tag is enough to allay these concerns. Other times the product isn’t significant enough to warrant any great concern. Much like the weight of the pliers, the importance of the comfort of the grips in your hand will depend greatly on how often you will be using the pliers and for how long. As long as the grips aren’t actually painful, an ergonomic grip isn’t necessary for infrequent users. If, however, this will be an everyday tool, the comfort of the grips will help both your grip strength and sustained effectiveness in completing the tasks at hand. Our list includes a variety of slip joint pliers, any one of which would do well to be added to your tool box. Take into consideration the type of work you anticipate doing with this pair of pliers. Think about how often you’ll be using them and how long. As a regular handyman who uses slip joint pliers every day, you will want to be sure that you have a tool that is strong, durable, and won’t cause hand fatigue. If you plan on keeping it around the house for an as needed tool, you need not be so discerning, but still be sure you’re choosing a quality tool for your money. Whatever your situation is, our list will be useful in choosing which slip joint pliers are right for you.